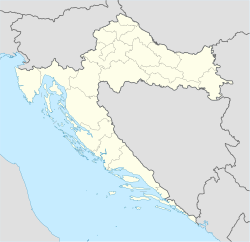 Kostrena (Italian: Costrena) is a Croatian municipality east of Rijeka on the Kvarner Bay. It is famous for its beaches and a long tradition of seafaring and seamanship. Because of its beautiful rocky beaches and a walkway that goes along the shoreline, it is very popular for recreation and sports. A scenic hill walk called Trim-staza is located on the northeast side of Kostrena. There have been some archeological excavations in Kostrena, discovering ruins from the Roman times. Lately, urban development has been increasing. Kostrena is also an industrialized suburb of Rijeka. An oil refinery and an oil power plant are located at Urinj and a shipyard Viktor Lenac is located in the bay of Martinšćica. The local soccer club is NK Pomorac. Kostrena is a popular place for scuba diving, offering a number of dive centers to do shore dives as well as some close shipwrecks located in the Kvarner Bay. ^ "Konačni rezultati izbora" (in Croatian). Retrieved 30 May 2017. ^ "Popis stanovništva 2011" (in Croatian). Retrieved 30 May 2017. This page was last edited on 25 March 2019, at 00:15 (UTC).